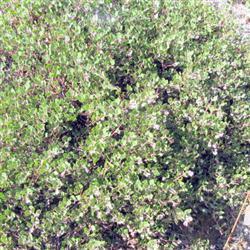 Arctostaphylos hookeri Monterey Carpet manzanita is a 1 foot by 4 foot evergreen shrub. It is a very neat and compact form with bright green leaves and pink flowers. This manzanita does best in an acid soil in coastal conditions although it has done well here in inland San Diego county. It is one of the slower growing manzanita groundcovers so use it in situations where space is limited or you have no time for pruning. However, it's worth the wait when you want to contrast your other plantings with its reliable bright green foliage.